Colonel Talbot himself arrived in 1803 and established Port Talbot, heart of the Talbot Settlement. Among the earliest structures in the area were forts to defend against American attack, mills, a distillery, numerous warehouses, and Talbot's own long, rambling home. After Talbot's death in London in 1853, the family of his assistant, George Macbeth, inherited his estate. In 1925, the land was acquired by a group of Detroit businesmen who planned to build a luxury resort complete with hotel and golf course. But the Depression ended their plans and the property has passed from hand to hand ever since. Talbot's derelict house was demolished in 1997, a sad ending for the home that was the heart of Elgin County's earliest settlement. 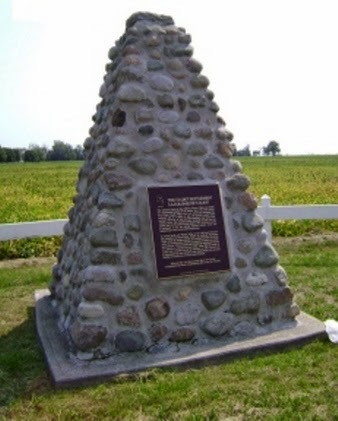 The roadside cairn shown above acts as a monument to the Talbot Settlement, the founder himself, and his little troop of hardy pioneers. It was erected by the Historic Sites and Monuments Board of Canada in 1926, at a time when Talbot's house was still standing nearby. One can't help but feel that if Talbot's home were in the U.S., it'd still be there, preserved as a pioneer museum. In a country with respect for its heritage, there'd be more than this cairn to look at.